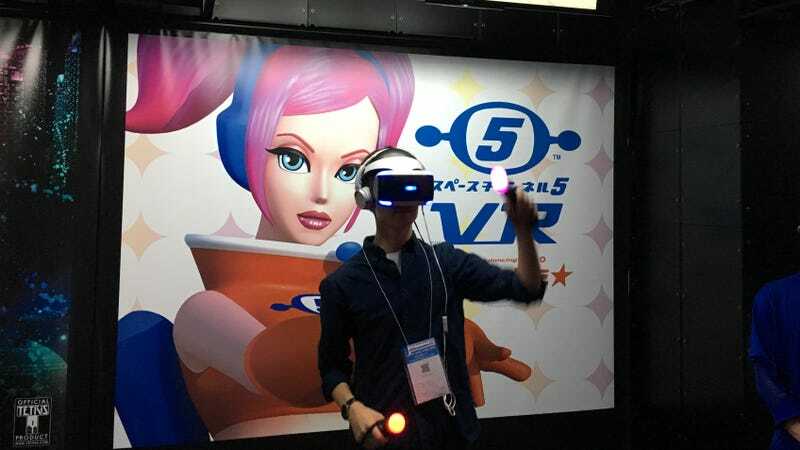 A Tokyo Game Show attendee plays Space Channel 5 VR. When I was in sixth grade, my best friend at the time penned a short story for a school assignment that was titled “The Video Game That Sucked Me Into It.” We did not have the lingo of “self-insert fanfiction” or “Mary Sue” at the time—I’m pretty sure neither of us even had an America Online account at this point—but this hard-copy tale was the offline, ur-version of that, the story of a young man very much like the author who found himself pulled into his CRT and on an adventure with the cast of Super Mario World. This would turn out to be a very common fictional trope among people our age. I did it too. I only mention my friend’s story because I laugh out loud every time I think about its title, and I was thinking about that title after recently playing Space Channel 5 and Dragon Quest in VR, two games that are about precisely this: Being sucked into the world of your favorite video game. Long these many decades later, it is finally an idea whose time has come. Space Channel 5 VR Kinda Funky News Flash! and the more prosaically-titled Dragon Quest VR are at the opposite ends of the spectrum of VR experiences. I played both games a couple of weeks ago in Tokyo. One’s a simple PlayStation VR game, the other is an elaborate, four-player, room-scale installation that uses a massive custom-built playing space in Tokyo. What they have in common is that you don’t play as the series’ well-known heroes. You play as a non-descript avatar, and you interact with the heroes just as you interact with the villains. In other words, you’re You. As a big fan of the Dreamcast originals, I’m really glad to have Space Channel 5 back in action. They were sort of the Dreamcast’s Parappa the Rapper, helping define the then-new genre of the character-and-story-based music game. The difference was the music was funk and the setting was something like Austin Powers In Space, but instead of Mike Myers with fake teeth the star was Ulala, a television news reporter in an era in which all TV news is set to music and dance. Ulala’s signature look, the cotton-candy pigtails and vinyl orange miniskirt, made her a striking game protagonist. But would you really want to “be” Ulala, in VR? To not actually see her in the game unless you look down to see her hands and feet awkwardly inverse-kinematizing themselves around as the PlayStation VR attempts to divine your body position? No. You want to see Ulala, to hang out with her, to witness all her perfect dance moves in life-size. So that’s what Space Channel 5 VR gives you. You’re a cub reporter who happens to be on the scene with Ulala when aliens invade the spaceport, and you have to engage in funky dance-offs with them to stop them from hypnotizing the human populace and/or get them to leave in humiliation. The Tokyo Game Show demo is pretty much a repeat, then, of the plot and setting of the first level of the original Dreamcast game. But that’s part of the appeal as well—being inside the world of a classic game that you have fond feelings for. It’s a hell of a lot of fun. The development team, made up of many of the original Space Channel 5 developers, has absolutely nailed the details. And that’s also an important part of the “inside the world of the video game” trick: that it matches up perfectly with what you’d imagine it to be. I’m not as much of a Dragon Quest fan as I am a Space Channel 5 fan, but I imagine that feeling of happiness when being enveloped by the world of a game series you love is the same feeling that’s currently being felt by thousands of Dragon Quest fans as they cycle through that series’ new VR installation in Shinjuku, Tokyo. Part of the same VR Zone facility that houses Mario Kart VR, Dragon Quest VR is an experience head-and-shoulders above all of the other branded VR demos in the whole place. (And it’s priced like it, too—about $30 just to play it once, on top of the VR Zone admission fee!). A Dragon Quest VR logo projected into the entranceway of Shinjuku VR Zone. The whole experience is sort of like going on a Disneyland ride. First, you wait. Not in a line, but in a little cordoned-off area, so that as soon as the group ahead of you is finished, you can be escorted in. Prior to the actual VR game, you’ll watch an introductory video that preps you for what you’re going to do: As a group of four people, you’ll enter into a series of Dragon Quest battles. Two of you will be warriors, swinging swords, holding up shields, and forming a barrier between the enemies and the two other players behind you, who are black and white wizards. Much like in Space Channel 5, you’re not playing as any recognizable character from the series. They show up later, heroes and villains both, at appropriately spectacular moments. But before you get to all of that, you do have to decide amongst yourselves who’s going to play what role in the party. Not wanting to rock the boat, I said I didn’t care, and got stuck being the healer, meaning that if we died it would be my fault. A trailer for Dragon Quest VR, with in-game imagery, is shown at the Shinjuku VR Zone where players wait to try the game. After the intro video, the next step was to proceed one step further into the Dragon Quest VR space, into a small room with a cart full of computers and assorted equipment. There, staff members strapped massive gaming laptops onto our backs. This let us move around the play space unencumbered by wires. We were brought into said play space, which is a large black room, something like a Hollywood soundstage. A grid of lines on the floor gave us our starting positions, and we were quickly given our VR headsets and motion controllers before we had too much time to look around behind the curtain. And suddenly, we were in the world of Dragon Quest. We looked around to see each other, no longer tethered to our boring human forms but now living Akira Toriyama puppets. After an interstitial screen to get us all synced up, we were in front of the King, who told us to go out and fight some monsters and slay their evil lord. Cool, no problem. What you look like in meatspace when you play Dragon Quest VR. We were thrown immediately into a battle. While a true recreation of Dragon Quest would have had everyone waiting around while we picked options off a menu, Dragon Quest VR is understandably action-based. We can only occupy a relatively small square of the playing field (pretty much just enough space for four adults to stand and swing our arms around without punching each other in the face), so the enemies started off in the background and moved towards us. The warriors got in front and hacked and slashed away, while we mages used spells to attack from a distance. The first battle, set in a green field against classic adorable monsters like Slimes and Drackies, was a literal and figurative walk in the park. I imagine that if you have ever dreamed of being transported into the world of Dragon Quest, this is precisely what you imagined you’d be doing. These guys were so cute I had to resist the urge to hug them. The next battle scene was much more intense: With your backs to a cliffside drop, you have to fight off larger, scarier, more damaging enemies like Golems. The elaborate custom setup for Dragon Quest VR is explained on an instruction sheet handed to visitors.